You must make reservations at least 5 minutes in advance of the time at Tower Bridge Bistro. Park at the Embassy Suites - we validate all valet parking! Walking distance to Old Town Sacramento. 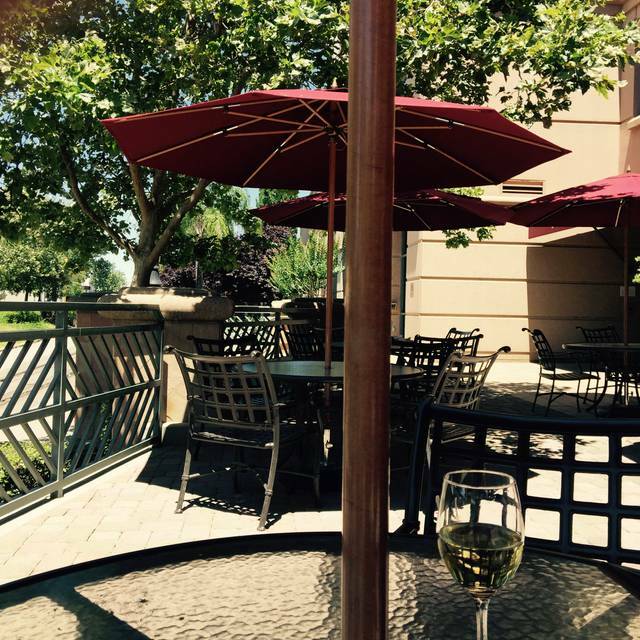 Come experience Tower Bridge Bistro’s New California-Tuscan cuisine inside the beautifully appointed Embassy Suites – Sacramento. We’re located a home-run away from Raley Field and the home of the Sacramento Rivercats. A train ride away from Old Sacramento and the Railroad Museum, two colorful blocks from the Crocker Art Museum and down the mall from the Capitol and Downtown Plaza Shopping Center. Dine amongst works by talented local artists while enjoying the sunset over the Tower Bridge outside our floor to ceiling windows. 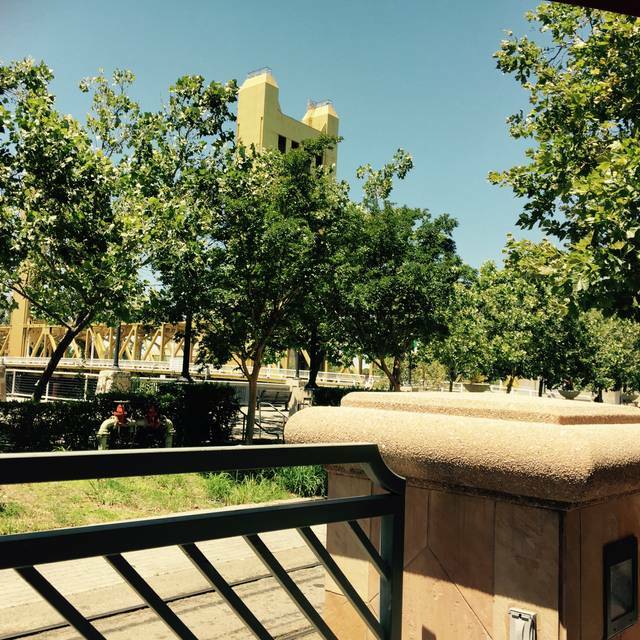 Enjoy our beautiful patio on the levee of the Sacramento River. Taste classic and new creations presented artfully alongside a wine list featuring over 80 selections of well-known as well as yet to be discovered gems. Prepare to settle for the extraordinary…. Everything was amazing. Food was great service was great and the view was perfect! Although we had reservations, we didn't get seated for 10 minutes, which is odd as it was not busy, there were empty tables and there were no other customers ahead of us. That may not seem like a long time to some, but when you have young kids, 10 minutes is an eternity. Our party of 4 were led to a table that had only 3 bread plates, one of which was dirty. Our host appeared indignant when we asked for it to be removed, and no replacement ever came. We had to wait another long time for our server to show up. In the meantime we had no bread or even water to preoccupy the kids. When our server finally arrived she was apologetic and turned out to be very nice, having a great rapport with the kids. She's the only reason I awarded any stars for service. I would've liked to have said it was worth the wait, but the crab phyllo appetizer was fishy and had bits of shell in it. The Cioppino broth was a mixed bag: the broth was flavorful but way too salty, the crab and lobster were decent, but the fish, scallops and mussels weren't fresh. Overcooking the shellfish did not help. The kids' corndogs were deemed yummy, but how can you go wrong with corndogs anyway? The minestrone soup was a pleasant surprise, it was laid-back and mellow on bean taste rather than being aggressive which suited me just fine. The food was great. The server was a little cheeky, but what killed it for my wife and me was they turned the lights on at 9:15 and started moving tables around and trying to push us out... mood kill! this was on Valentine’s Day with a 8:00 reservation. Food was good. Service was good. Based on the menu we were served, yes I would. Hubby loved the Italian Sausage Pasta. I enjoyed mostttt of the steak, but one end had a bit of fat and sinew which i had to cut off and it was sorta difficult to see that under the sauce. otherwise the taste was very good. The experience was great the food was very good ,service was good the only thing to complain about is we didn’t get a bread basket . We really enjoyed our night out . Much to noisy as an upscale dinner spot with: (1) noisy toddler; (2) a loud waiter; (3) very loud customers. Since there is minimal sound-absorbing interior items, it gets very loud. Fits the role of a bistro though. 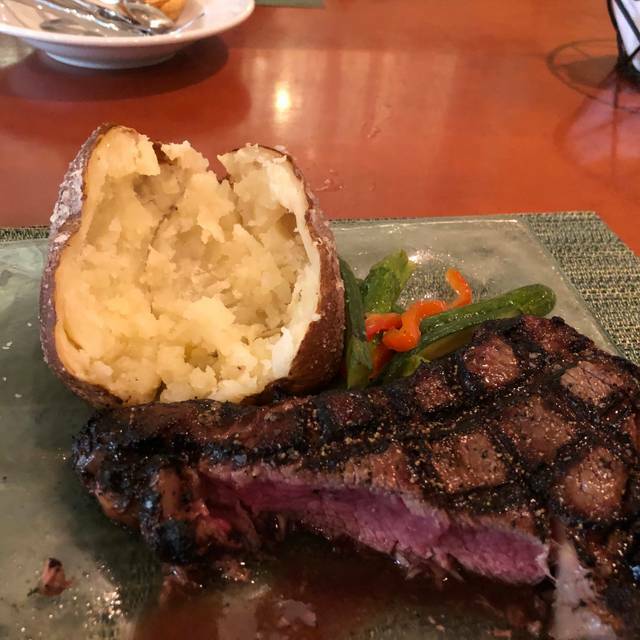 We went for restaurant week, the steak was huge, thick and juicy! I ordered well done and it was cooked perfectly and was easy to cut and the chef did no have to butterfly it! It was amazing! Brussel sprout salad was really delicious as was the sturgeon. Restaurant needs to be updated. Furniture belongs in an old diner, placemats from Target and cheap cutlery. Table was sticky and my wine arrived with cork in it. We nearly left...twice. Food was great tho. Very ambitious menu for a tiny place. We have gone to this establishment a lot but this time was not the best. The food was fair and overall for our cost it was not up to standards. Surprisingly good for a hotel restaurant. The pork chops were tender, tasty and delicious. My server was excellent and suggested I get a salad or soup first because the pork chops are cooked to order and take a while. I did and the soup was good. The porkchops were worth the wait. Dinner and dessert were excellent. Price was reasonable and the wait staff were wonderful! Great dining experience! The presentation of the grilled seafood salad was innovative but was not easy to navigate, have Ng to cut up the lettuce and dig out the lobster meat from the shell. It was dry and over cooked. The shrimp were cooked perfect. I would not order that dish again. My friend was disappointed as well. The table next to us was very noisy. David is an excellent waiter - just the correct availability without being overly intrusive. Remembered the table we sat at 2 months ago and our conversation. We have never been disappointed. Always a great time, location, food, service Dave our server, he's been always above board. Across the street from Old Sacramento. server was wonderful. sadly, the food was terrible. calamari appetizer had too much pepper and salt. the salmon entree had too much salt in the sauce and on the fish. We dine here several times a year and every time the service has been the best, Dave is friendly, tends to your individual requests, wouldn't be the same without him. The food has been perfect every time. Early birds get the view and a more relaxed atmosphere. Valet parking makes it easy. very friendly atmosphere. The Tower Bridge Bistro is my favorite restaurant. Everything about it is awesome. Our guests were very impressed! We all (6) ordered different entries and everyone was pleased. I cannot say enough good things about the experience. Our waitress was very pleasant and very attentive. Her assistant server was also very pleasant and conscientious. We could see the sunset from our window table, it was nice. You could not see the water from inside, but maybe you can a bit from the patio. I have been coming to this restaurant for 11 years. There wait staff (especially David) make it a better place to go with family, friends or even a date. Took my son and daughter-in-law to dinner as we were staying at the Embassy Suites. Food was excellent. I had the Halibut, my son had the scallops, daughter-in-law had the salmon, my husband had the scallops and everyone loved their dishes. I had the beet salad it was wonderful but enough for two people, Lisa had the onion soup and it was awesome. Everything we ordered was wonderful. Our waiter was the best. I will go back there again., Very convenient as we all drove for awhile to get there and really didn't want to have to go out of the hotel that evening. Not to many people there n a Friday night which was fine as far as I was concerned. Delicious food and drinks, great ambiance, quiet, and professional attentive informed service. The food was great. The service excellent. It's reasonably priced. I had grilled halibut and it was delicious, it and artichoke hearts on the plate were covered in some kind of white sauce which should have been left off the dish, two friends had scallops which were covered in some type of tomato sauce that should have been left off as well. Our only other issue was it took an hour to get our food and there was only 1 other table of people there and they had already been served. This was our first trip to this restaurant. It was somewhat of an accident because it was last minute and the only restaurant in the area that had our requested time available. We were very pleasantly totally satisfied. Could not ask for more. Very quiet and lots of seating to choose from. Close to Old Sacramento and river and has outdoor seating. Excellent service. Very friendly and helpful. The ambience inside isn't that great but the outside overlooking the Tower Bridge is wonderful. Best steaks we've had in a long time. We will return when it's not too hot to sit outside. A wonderful dining experience, everything was perfect, service, food, atmosphere, view. One of our favorite Sacramento restaurants. Every visit has been great . Never a disappointment with 4 years of dining here. We had lots of fun with a great view of the tower bridge. Absolutely perfect. Enjoyed our Date Nite!!! Service was exceptional! Food was very good, we had the Tri-tip and Mahi Mahi. ( The Mahi Mahi was prepared the best I Have ever had.) and the fresh veggies were amazing as well!!! We love this place; it never disappoints. It's a little on the pricey side, but we go on special occasions for a treat. The service is amazing! The fish was cooked to death and the vegetables were almost inedible. Some orders were OK but not great. It was disorganized. It was like we were at a busy venue at rush time, but we were the only one there. My best friend Karen and I had a wonderful lunch there on the patio. Food was delicious and atmosphere was lovely. I would definitely recommend your restaurant. The staff was great and very friendly! Antonio provided great service and made us want to go back soon to visit! Need to update the menu on open table. not appropriate to feature the incorrect menu as we made the reservation through open table hoping to eat items you feature that were no longer available. Very good service, very good food overall. The poached halibut was disappointing. It was fishy smelling and too salty to enjoy. I should have sent it back. The panko crusted prawns were unbelievable delicious. The steaks, the lamb, the pork,the chicken all excellent. Celebrated Valentines Day with a special prefix menu that had good selections and quality food, but unfortunately the kitchen's preparation did not match the quality of everything else. The entres came out lukewarm, which was promptly and graciously replaced by wait staff. The replacement was okay, but potatoes were so overcooked they could not be cut with a knife. We will try one more time when we can order from the menu. The Caesar salad, pork chop entrée, and the apple pie were scrumptious! Our current favorite downtown Sacramento establishment.